As a boy, I had the opportunity with my family to frequently go rappelling – descending a cliff on a rope. When I first started out, these “cliffs” were no more than 15 to 20 feet tall, offering the opportunity to learn without inducing much vertigo. As skills progressed, the cliffs we descended became taller. 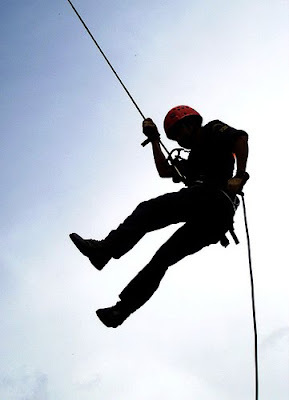 It might not seem particularly safe to walk, bounce, or run down the face of a cliff but with secure anchors and strong equipment, rappelling is a relatively safe activity with the greatest risk being scrapes or increased anxiety caused by a fear of heights. If safety procedures are not followed, however, rappelling can be fatal. This is true for many activities in life, including driving a car. In order for rappelling to be safe one must be securely anchored. My father, always conscious of safety, would, whenever possible, tie a rope to one anchor and then tie that anchor to a second anchor – a strong tree for example – in case the first anchor failed. In this manner, we always knew we had a sure foundation when we bounded down the cliffs. As an additional safety precaution, someone would remain at the bottom the cliff acting as belayer. The belayer is able to provide friction on the rope by pulling it away from the cliff face should the person rappelling slip. The belayer can stop the person on the rope should she need to regain her footing. One other safety principle was to never use faulty equipment. Once climbing ropes showed signs of significant wear, they were replaced. Before and during each rappelling outing, we inspected our ropes, harnesses, ascenders, carabiners, slings, gloves, and descenders to make sure all were in working order. If we had a question about any piece of equipment, it wasn’t used. New equipment is always cheaper than a person’s life. These same principles can be applied to the gospel. I’d like to talk about one important principle that provides safety for us in this adventure of life – the making and keeping of covenants, which covenants were restored unto the earth through the prophet Joseph Smith. These restored covenants were first given to Adam and Eve and then given down the generations. Abram made the covenant with The Lord, who told him: “But as for thee, behold, I will make my covenant with thee, and thou shalt be a father of many nations. And this covenant I make, that thy children may be known among all nations. Neither shall thy name any more be called Abram, but thy name shall be called Abraham; for, a father of many nations have I made thee.” (JST, Genesis 17:8-9). Abraham truly is the father of many nations. Judaism, Christianity, and Islam all are tied to Abraham. This Abrahamic covenant, which includes the blessing of numberless posterity, blessed and still blesses the children of Abraham. Through the covenant, Abraham and his posterity, promise to keep the commandments of the Lord. In return, the Lord promises to be “a God unto [him] and [his posterity].” This is a promise that we can be part of God’s family; we are His children but through the Abrahamic Covenant we can become worthy to inherit all the He has. By doing the simple task of keeping the commandments – the covenants – of the Lord, He promises us everything. We give the Lord a seed, He gives us a mighty tree. We give Him our stony hearts of flint, He replaces them with fleshy hearts of charity. We consecrate unto Him our lives through covenant, He blesses us with Eternal Lives. God truly is our Father and desires to bless us as much as we are willing to receive. We find a record of God’s covenants with His children in the scriptures. The Old Testament contains covenants given to God’s children before the coming of Christ, prominently through Abraham and Moses. The New Testament contains covenants offered by Christ and His apostles. The Old and New Testaments are rightly called the Old and New Covenants. The new covenant given by Christ, the mediator of life, was lost from the earth not long after the Savior’s death, resurrection, and ascension into Heaven. His apostles were killed and the purity of the gospel polluted by philosophies of men. Over the next 1700 years, people wandered about in mists of darkness with varying degrees of light. This old world apostasy was paralleled, although off-set by a few hundred years, by an apostasy in the new world among the descendants of Lehi. During the time of apostasy many were true to the light and knowledge they had and sought to follow Christ but the covenants of the Lord were not available upon the earth. After the falling away – the great apostasy – to the young Joseph Smith, the Lord re-introduced covenants given in days of old. These covenants are contained in the Doctrine and Covenants. The Book of Mormon is another record of covenants. This record contains the covenants given to small groups of people in the Americas. The covenants in Book of Mormon also apply to the children of Israel in our day, particularly those who are descended from Lehi. Mormon wrote The Book of Mormon specifically for our day. It is a compilation of teachings spanning more than one thousand years. The prophet Mormon compiled and edited the book, passing it on to his son Moroni, who finished the editing and writing. Moroni then buried the plates, sealing them up unto the Lord, so that they might come forth by the power of God at an appointed date. That appointed time was in the early 1800s through the work and righteousness of the prophet Joseph Smith. God called Joseph Smith to bring new light to the world; through Joseph, the Lord reestablished the sacred covenants that had been taken from the earth because of wickedness. Over the years, the Lord gave numerous prophesies concerning the breaking of the covenants and the falling away in apostasy that would occur before the final redemption and the second coming of the Savior. The wandering sheep, led astray by unfaithful shepherds, would turn and seek the Lord, their Good Shepherd. After a time of wandering there would be a time of restoration. In the Doctrine and Covenants we read of apostasy before and after the restoration of the gospel: “And the arm of the Lord shall be revealed; and the day cometh that they who will not hear the voice of the Lord, neither the voice of his servants, neither give heed to the words of the prophets and apostles, shall be cut off from among the people; For they have strayed from mine ordinances, and have broken mine everlasting covenant; They seek not the Lord to establish his righteousness, but every man walketh in his own way, and after the image of his own god, whose image is in the likeness of the world, and whose substance is that of an idol, which waxeth old and shall perish in Babylon, even Babylon the great, which shall fall.” (D&C 1:14-16; emphasis added). After the falling away came the restoration, starting with Heavenly Father and Jesus Christ visiting Joseph Smith in 1820. This great restoration is still occurring, as Pres. Uchtdorf eloquently taught during the Priesthood Session of this past General Conference. We have a description in Doctrine and Covenants Section 1 of why the gospel was restored. “Wherefore, I the Lord, knowing the calamity which should come upon the inhabitants of the earth, called upon my servant Joseph Smith, Jun., and spake unto him from heaven, and gave him commandments; And also gave commandments to others, that they should proclaim these things unto the world; and all this that it might be fulfilled, which was written by the prophets—The weak things of the world shall come forth and break down the mighty and strong ones, that man should not counsel his fellow man, neither trust in the arm of flesh—But that every man might speak in the name of God the Lord, even the Savior of the world; That faith also might increase in the earth; That mine everlasting covenant might be established; That the fulness of my gospel might be proclaimed by the weak and the simple unto the ends of the world, and before kings and rulers. (D&C 1:17-23; emphasis added). Later in the Doctrine and Covenants, the Lord states: “And even so I have sent mine everlasting covenant into the world, to be a light to the world, and to be a standard for my people, and for the Gentiles to seek to it, and to be a messenger before my face to prepare the way before me.” (D&C 45:9) Thus, we can be guided by the light of the new covenant; we can rally around it as armies would rally around a standard. The everlasting covenant is a covenant of peace. To fulfill it, the Lord sets His sanctuary in the midst of His people. The Lord’s sanctuary is His temple. In addition to be gathered in to the stakes of Zion, we are gathered in to holy places of consecration and covenant, even the temples of the Most High God. Isn’t it wonderful to see these prophecies of Ezekiel and Malachi fulfilled around us? Temples are beginning to dot the earth. Most members of The Church of Jesus Christ of Latter-day Saints live within relatively easy access to a temple. In the temple, we make sacred covenants that prepare us to return to live with God and become His eternal children. In order to access those temples, we need to first make covenants through baptism and confirmation, which covenants come from faith. This principle is taught in simplicity in the manual Preach My Gospel. “Faith in Jesus Christ and repentance prepare us for the ordinances of baptism and confirmation. An ordinance is a sacred ceremony or rite that shows that we have entered into a covenant with God. “God has always required His children to make covenants. A covenant is a binding and solemn agreement between God and man. God promises to bless us, and we promise to obey Him. God sets the terms of gospel covenants, which we either accept or reject. Keeping covenants brings blessings in this life and exaltation in the life to come. “Covenants place us under a strong obligation to honor our commitments to God. To keep our covenants, we must give up activities or interests that prevent us from honoring those covenants…. We should desire to receive worthily the covenants that God offers us and then strive to keep them. Our covenants remind us to repent every day of our lives. By keeping the commandments and serving others we receive and retain a remission of our sins. “Covenants are usually made by means of sacred ordinances, such as baptism. These ordinances are administered by priesthood authority. Through the ordinance of baptism…we covenant to take upon ourselves the name of Jesus Christ, always remember Him, and keep His commandments. As we keep our part of the covenant, God promises the constant companionship of the Holy Ghost, a remission of our sins, and being born again.” (Preach My Gospel, Lesson 3). We receive the priesthood of the Lord and the ordinances of the gospel so that we might make these sacred covenants with God. The restoration of the gospel restored the covenants of The Lord. The covenants bind us to God and us to our fathers, mothers, and children. In this manner is the restored gospel about welding families together and to God. This welding occurs in the temple. All that we do in the church should help us look to the temple – not just look but prepare and enter for therein is found the New and Everlasting Covenant of God. The temple provides the sealing of families. The sealing of families is the culmination of covenants; it is the new and everlasting covenant of marriage and the creation of eternal family units. The covenants we make through the ordinances of the gospel ultimately tie us directly to Christ. They bind us together as eternal families and bind us to Christ. Ironically, it is through these bonds that we are made free. We “become His sons and His daughters.” We are blessed both with root and branch eternally. These sacred covenants require obedience on our part but in return we can be sealed to the Savior, we become eternally His. Covenanting gives us access to His blessings. Jesus is like a song in the night. He is a pillar of fire. He restores breaches in our hearts and families. He stabilizes the rudderless and calms the stormy seas. The Lord blesses us with His tender mercies – friends, family, and other loved ones who provide meals and support. There are the mercies of the promptings and love provided by the Comforter – the Holy Ghost. Most importantly, we are blessed to know that because of the sealing power of the Priesthood – through the covenants of the temple – Allison will be forever part of her family. That knowledge is almost unbelievably comforting. I phrased it that way because at this time when we think we might be completely devastated, we feel some measure of peace even though peace seems so out of place. My family shall see Allison again. All those who have lost loved ones will see them again! Through the sealing power of the Priesthood and through the eternal covenants of the Lord, families can be together forever. Allison is sealed to her parents and family by this same power. I know that we will all be resurrected some day because of Christ’s death and resurrection. As we remain faithful to these covenants we made in the Holy Temple of God we can return to live with our loved ones and our Father in Heaven. And now another story illustrative of the blessings of covenant making. We can find safety in life by preparing for sacred covenants, especially those made in the temple, by expressing and building faith in Christ. We can find safety by securely anchoring ourselves to Christ through covenants. We can find safety by binding ourselves to our families and following the guidance of the prophet. Covenants bring us safety and great blessings – both here in this life and in the life to come.